Over the years, Camp Nominingue’s canoe tripping program has made subtle adjustments. New routes have been explored. Old routes have been discarded. New equipment and procedures have been introduced, but many of our principles have remained the same. One good reason for maintaining these principles is that they are at the base of our canoe trip risk management program. 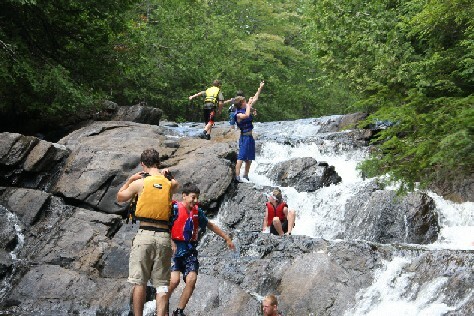 Most of our canoe trips head out with five campers and two staff. When we add a sixth camper, we add a third staff member. 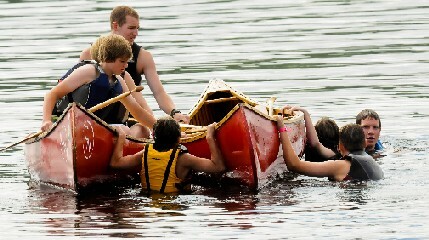 We feel that it is important that there be a counsellor in each canoe on our canoe trips. This ensures that the paddlers in each canoe have the experience, the leadership and the strength to handle all the various conditions that we encounter on our trips. Nominingue chooses to travel on flat water rather than on moving water. This removes the greater risk that rapids and moving water pose for canoeists. It also ensures that damage to our cedar and canvas canoes is minimized. A conscious decision was made at Nominingue to use cedar canoes in our canoe trip program. When loaded, these canoes are reasonably stable. 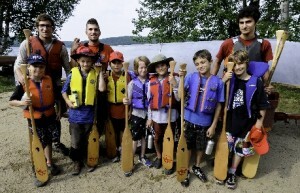 They also enable the staff and campers to live an experience that comes closer to what the voyageurs of old experienced. There is nothing like paddling a cedar canoe in the wild! As human development has spread throughout the north, canoe trip routes have been restricted. 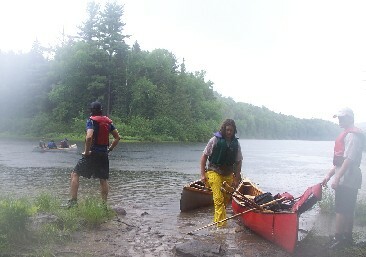 In the twenty-first century, all Camp Nominingue canoe trips travel within the boundaries of two provincial parks: Papineau-Labelle and La Vérendrye. One advantage of this situation is that our trips travel along routes that are known by experienced paddlers at the camp. They share their knowledge and experience of these routes and lakes with each new generation of trippers. The advantage of certain campsites is recognized, time requirements to complete a portage are recorded, exit routes in case of emergency are marked and this information is recorded on itineraries for future use. 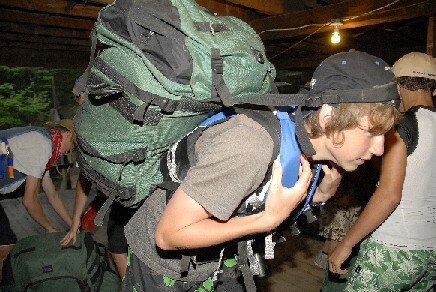 For the campers, the preparation for canoe trips begins on their first day at camp. After lunch, every camper will complete a swim test, which determines his swimming ability. After passing the deep-water test, he will then participate in a canoe rescue, where he experiences dumping, emptying a canoe in deep water and climbing back into a canoe. Although this practice does not make an experienced canoe tripper, it is the first step along the path to confidence and skill on the water. At Nominingue, we introduce campers from seven to sixteen to the joys of canoe tripping, whether it is paddling across a quiet lake in the sun, struggling up a steep hill through mud on a portage, cooking a tasty meal over an open fire or listening to the cry of a loon as dusk falls. We hope to develop in our campers a love of the outdoors and a confidence in their ability to travel in the Canadian wilderness.